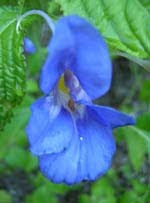 Arrowhead Alpines Blog: A BLUE impatiens! This does sound awesome, but I'm somewhat suspicious of photos of plants. I'll be anxious to see what you get in teh spring and how blue they really are. Yeah, I know... blue flowers have a tendency to actually be purple in person. We'll see! I'll certainly post pictures and thoughts once they flower. LOL. Just figures they would be out of stock. Everyone including myself will be wanting blue impatiens.I hope it is a true blue also that would really make it a winner. Gardening disorder? This seems like a normal reaction, after all it is BLUE! BLUE! And you have the 7 seeds left in the universe! Good for you! Wait, it's BLUE! I want some!!! And here I was thinking I could order some of those seeds to add to my blue flower collection...you lucky guy, you got the last ones! Oh - I can't wait to hear how these work out for you. I had a client tell me she saw such a thing in a local garden store a couple years ago and she wanted them (I plant roughly 300 impatiens for her every year) - I researched and came across these, but never any seeds. I think she was smoking something - or perhaps was looking at something else - anyway, good luck and let us know how they grow.